Our Lady & St Anne’s Choir was formed in 1986 and is a traditional 4-part choir (soprano, alto, tenor, bass), currently numbering 16, whose aims are threefold; to lead the congregation in their singing of the music, in order to enhance the prayerfulness and thereby deepen their experience of taking part; to keep alive the musical traditions of the Church; and to introduce new music into the repertoire of the parish. Singing at the 10.00am Mass every other Sunday, alternating with the Music Group, and on all major Feasts and celebrations, choir members sing a wide variety of motets and also regularly include some Gregorian plainchant in the Mass, as well as singing traditional and modern hymns and Mass settings. In addition to singing regularly at Mass we also try to ensure that we make ourselves available for any funerals held in church in order to support bereaved families at a difficult time. 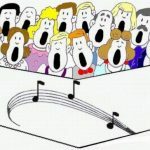 We meet every other Tuesday evening, in the weeks preceding the Sundays on which we sing (a list of those dates is posted on the notice board in the Narthex), in the Church, from 8.00pm and practices usually last about an hour. We are always looking for new voices to swell our numbers and no auditions are held although a real commitment is required to attend regularly both practices and the occasions on which we sing. Members of the choir and their partners also meet together socially at least twice a year. For more information please contact Clare Gough – goughtowers@btinternet.com or speak to her or Father Patrick after the relevant 10.00am Sunday Mass.